The first masquerade of the season was given at the Turner opera house last evening on roller skates, by August Henze. There was a fairly good crowd of skaters and the galleries were well filled with spectators, all seeming to enjoy the fun of trying to solve the mystery of the identity of the man or woman behind the mask. The identity of those in costume for most part remained merely a matter of guess work from 8:00 to 9:00 o'clock, when the order to unmask was given and the announcement of the prize winners was made. There was quite a variety of costumes without an over production of clowns as is almost invariably the case at a masquerade, there being but three. There were also rubes, turks, cowboy, fencing girls, jockeys, tennis girls, chimney sweep, Little Red Riding Hood. There were some by which with a stretch of the imagination might have been taken for ancient historical characters while there where others who did not make any pretence of representation. The gong was sounded at 9:00 o'clock and the prizes were announced . . .
An ordinance providing for the protection of the city park, situated in the First ward in the city of Watertown (Veteran’s Park today) . . . No person shall step or walk on the sod or grass, or deface, mutilate or injure the trees, flowers or shrubbery, or deface, mutilate or injure or sit upon the steps of the Soldiers' Monument, or catch, kill, destroy, wound, maim, worry or molest the birds or game, or deposit any filth or commit any nuisance, or suffer or permit any dogs belonging to him, or in his charge, custody or control to chase, worry or molest, disturb or catch any bird or game, within the city park, situated within the First ward of this city . . . no person shall ride, drive or lead any horse or other animal, or ride any bicycle or velocipede, upon or across said park or any portion thereof. Provided always that a person lawfully employed by the Board of Public Works, in doing work in or upon said park, may step or walk on the sod and grass thereof. Nine past exalted rulers of the Watertown Elks Lodge No. 666, and a large number of “Old Timers,” Elks who have been members of the lodge for at least 21 years, were guests of honor at a dinner and meeting held at the lodge last night. The nine past exalted rulers honored were Attorney Charles Payant, A.A. Beyer, Dr. J.R. Casanova, Attorney Charles E Kading, Gordon Scott, Walter Schlueter, A. E. Bentzin, L.M. Bickett and G.T. Lange. All were present except Mr. Bickett. An interesting program was carried out at the High school auditorium yesterday morning to commemorate the memory of the immortal Abraham Lincoln. The feature of the program was an address by Mayor Arthur Mulberger on the life and character of Lincoln. The mayor in his address showed that great events center about great men and that whenever the country needed great men, some mastermind came to the front and proved to be a match for the existing conditions. The mayor related how Lincoln's early life was wrought out under adverse circumstances, and showed how by persistent efforts and courage he became a national figure. In concluding his remarks, he spoke of the conditions of the present time and how we were in need of men like Lincoln at the present time. The address of the mayor lasted about an hour and was listened to very attentively. A new automobile dealership will open in Watertown on March 1, according to James and Clyde Kennedy, owners of the business. The dealership, to be known as Kennedy Chevrolet-Buick, Inc., will be located at West Main Street and Votech Drive, in the former Feldner Chevrolet building. James Kennedy said he has reached agreement with officials of General Motors for the Chevrolet and Buick dealership franchises in Watertown. The city has been without a Chevrolet dealership since Feldner left the business several years ago, and the Buick dealership is being transferred from Petros Pontiac, Cadillac, Oldsmobile, GMC, Inc. In a few short weeks, the Watertown Post Office will be losing its two top administrative employees. Postmaster Art Hamann is retiring from the U.S. Postal Service and Scott Wrucke, supervisor of customer services, is leaving to become postmaster of the post office in Green Lake. Hamann's last day of work is Jan. 2, 1998. Wrucke was supposed to have begun his new job already, but will stay in Watertown for the first few weeks in January to assist Nick Chapel, who will serve as officer-in-charge until a new postmaster is hired. Hamann was hired as Watertown's postmaster to succeed Janet Bauer, who left on May 24, 1989. Dave Pirkel, senior center of Watertown High school's basketball team, has been elected honorary captain of the squad for the 1957-58 season by his teammates. Pirkel was a strong rebounder and top scorer on the team. Tom Gamroth, junior forward, was elected most valuable player and Ralph Krueger, junior guard, was named hardest working player on the club. Gamroth started the season at a slow pace but came along well and was an outstanding performer at season's end. Krueger was a perpetual motion performer at guard and a good scorer. “I can't think of a nicer thing to have happen,” said Watertown High School Athletic Director Harris Grabow. Grabow was referring to Watertown's trip to the WIAA State Boys' Basketball Tournament this week which coincides with the announcement of his retirement. The school board will act on Grabow's request to take early retirement at age 62 at Wednesday's meeting. Grabow's relationship with Watertown and basketball goes back a long way. He coached the 1960 team which played in the state tournament and was the co-captain of the 1939 Gosling team which won the Class B title. Former athletes, teammates, students, family and friends made up the crowd of some 200 wellwishers at Harris Grabow's retirement banquet Tuesday evening. Grabow has served as Athletic Director at Watertown High School since 1966. Prior to that he was the Gosling basketball coach for 20 years and took his 1960 squad to the WIAA State Tournament. He had been there 21 years earlier as a member of the Goslings' 1939 Class B state Championship team. An Oconomowoc-area man has been hired postmaster of the Watertown Post Office. Jeffrey D. Hoffmann, 34, is succeeding Art Hamann, who retired in January. Hoffmann started his career with the postal service as a letter carrier in 1988 in Milwaukee. He worked his way up the ranks as a supervisor, followed by assignments as station manager for three post offices in the Milwaukee area. His most recent position was station manager at the West Milwaukee branch, where he was responsible for 140 employees and 40,000 deliveries daily. Splendid Pie Plant — Mr. Hezekiah Flinn of this city has presented us with four stocks of the best Pie Plant we have ever seen, without exception. They were about two feet in length, two inches through and six in circumference. They were not the Cahoon variety but much tenderer and milder. We have never seen their equal for all the purposes for which this vegetable is esteemed and now so widely used. The leaves were almost twenty feet in circumference, and were about as large as a common umbrella. They show what care and intelligence can do in the way of improving graden productions. Concert — “The Kimbles,"a new company of minstrels which has recently been organized, will give a concert of vocal and instrumental music in this city, at Cole's Hall, tomorrow evening. They can play the banjo, strike the guitar, rattle the bones, crack a joke, and sing all varieties of songs to perfection — except when they happen to fall short of that high mark. Dennis' Block, West Side of the River. and Lager Beer by the bottle or glass. Free Lunches of the most delicate dishes of the season will be served up every forenoon. The favorite kinds of Havanas and Prineapees can be had at all times. Oyster and Game Suppers, accompanied with the best drinks when desired, will be served up on the shortest notice and in the most approved manner. No pains will be spared to make all who visit the St. Julien pleased with their entertainment. B. MILLER. Supper at the St. Julien. The proprietor of this well known and popular establishment, B. Miller [Bernard], entertained about fifty persons of this city on Monday evening last, with an oyster and quail supper, which was in every respect excellent. His guests were well pleased and there is not one of the number who would not willingly bear testimony to the superiority of the festival and be much gratified with an opportunity of repeating the performance. One of Watertown's veteran barbers, Clarence G. Young, today announced his retirement from business. He has operated Young's Barber Shop at 101 South First Street for the past 30 years, but his service as a barber in this community goes back years before that. Mr. Young ended his barber career yesterday. In making his announcement today he said he has sold his business to Floyd Wilder of Ripon. Otto C. Riebe has drawn plans for a new two story brick building in North Water Street for Frank B Weber, the dimensions for which are 22x46 feet. He has also drawn plans for a residence now under construction by Mrs. Mary Moran in  North Warren Street, plans for a residence for Wm. Wedemeyer in Montgomery Street, for a residence for Albert Valaskey in  Jones Street, and for a garage for Edward Buroff in North Third Street. A new residence is being erected in Church Street by Daniel Kusel, Jr, the plans for which were drawn by Otto Uehling, of Milwaukee. The Weber store in North Water St. and residence adjoining are offered for rent cheap. The store is 24x70 feet and is suitable for a general merchandise store—has a basement and is fitted out with all modern improvements. In the rear of the store are a fine barnyard and stables which will accommodate 85 horses. This is one of the best business stands in the city, and the right party renting it can make it a money-maker. There is a saloon adjoining the store doing a fine business, and the large elevator of the Watertown Grain Co. is 1 1/2 blocks away, which adds much to the place in a business way. The store will be remodeled to suit tenant. The residence adjoining contains 10 rooms, has everything modern and [is] in excellent repair. The store and residence can be rented as a whole or separately. For further particulars apply to Frank B. Weber, 516 North Washington St., Watertown, Wis.
Frank B. Weber, for many years a member of the former lumber firm of J. Weber & Son, has opened a general merchandise store in the Weber building at 212 North Water Street. He has put in a brand new stock of dry goods, groceries, hats, caps, gents’ furnishing goods, crockery, green and dried fruits, etc. Goods delivered free to any part of the city. Free stabling in connection. Mr. Weber’s past honorable business dealings in this city will ensure to him a large share of the patronage of our people. The Gazette wishes him success in his new venture. The 29th section of the 7th Chapter of [the City Charter] provides expressly that the Street Commissioners "Shall give notice to all owners and occupants of lots which may be deemed injurious to health by stagnant water remaining thereon, in the official paper for ten days, to abate such nuisance by draining or filling such lot within a reasonable time therein to be specified." We concede for the sake of the argument that the delay occasioned by the required ten day's notice may be disastrous and result in consequences fatal to the health of our city. . . Any owner or occupant of a lot who has the welfare of himself, his family or the community at heart, should not, and probably will not, hesitate to take early and efficient measures for the correction of the evils complained of. No argument is necessary to show that they are dangerous ones—deleterious to health—and if not speedily remedied will result in sickness. We have had several cases of fever already. Every one knows that the first great principle is to make our city and its streets clean. Cellars, too, in which water has stood for a long time—of which there are a great number about town-should be thoroughly cleansed and purified. Lime, or other disinfectants, cannot be used too freely, and we hope that their application to the streets, alleys, backyards, cellars, out houses and the like, will not only be prompt but bountiful. Before another number of our paper is issued, the Anniversary of our National Independence will have passed. Another year will be added to an infant nation's age, and the bond of union strengthened by the trials and experience of another cycle. The recurrence of this event is suggestive of many thoughts and recollections that should, and in the breast of the true friend of freedom do, inspire renewed confidence in the permanency and stability of free institutions. On that day the heart of the American citizen beats warm with gratitude, his step is elastic and his bearing proud. His daily vocation is suspended, his cares and business laid aside, and his individuality forgotten in the pride of citizenship . . . Despotic pretensions produced resistance that, crowned with success, resulted in incalculable and untold blessings. The "arms of the mighty was broken," and "the stone that the builders rejected" was made the corner stone in the edifice of universal freedom. MILLINERY & DRESS-MAKING. Mrs. Webb would inform her friends and the public generally that she is not going to abandon the millinery business this spring, but, on the contrary, has just received a well selected stock of spring and summer goods which she is prepared to sell cheap for cash or ready pay. Having employed Miss Halverson, a superb milliner from Chicago, she feels confident she can suit the tastes of all who may favor her with their patronage. She is also prepared to cut, fit and make dresses by the latest and most approved style. Her prices will be the same as heretofore, believing them to be as low as any one can afford to do dress making and do it well, and if she does not do her work as cheap as her neighbors, she will do it better or no charge will be made for the effort. A social dance will be given by Fred. Cooley at his commodious hall this evening. A gay party, lively music, a table profusely covered with the choicest viands, cannot fail to furnish all who delight to move through the mazes of the dance a most favorable opportunity to indulge in so exciting and healthful an exercise. Fred. will leave nothing undone that will contribute to the pleasure of his guests. The dogs still flourish in our community. To be sure, most of them are provided with a collar, name and number, but they run about nearly as numerous as ever. No less than two hundred and four have been registered in this city during the present Spring. Who would believe that over two hundred and twenty-five dollars would be paid to secure the existence of nearly as many useless creatures as ever drew breath, for we take it for granted that not one in ten is worth the food he eats for any purpose whatever. We have alluded to this subject to call attention to the fact that every one who keeps a dog unregistered is liable to a fine of five dollars for so doing. As there has been one or two cases in this city of parties being arrested for this offence, a hint may be sufficient to prevent any more such unpleasant incidents. HOW IT LOOKS ABROAD—The classic correspondence between our City Superintendent of Common Schools and one of the teachers, which we published some time since, has been extensively copied by our exchanges, with such observations as tended to show their estimate of the fellow who was a party to it. It is generally regarded as the only specimen of the kind extant. After publishing it, the Waukesha Republican speaks of it as follows: “This Superintendent Gill is the same man that ordered the reading of the Bible in the Public Schools of Watertown, to be suppressed. State Superintendent Draper, sent a very sensible and dignified letter to the School Board of that city, giving his reasons why the bible should be used in schools. Of course this allusion to religious instruction is a miserable fling from a very small pattern of a man, as the above correspondence indicates Mr. Gill to be. The Watertown Democrat, from which we extract the above, gives this shrewd specimen of a Superintendent some very excellent advice regarding the duties of his office." "Postage cannot be paid on regular newspapers or periodicals, for a less term than one quarter; and in all cases, postage must be paid on such matter at the commencement of the quarter." "The Post Master who collects the postage on newspapers, periodicals, etc., quarterly or yearly in advance, is entitled to the commissions on the same, although he may go out of office immediately thereafter, and the paper or periodical be delivered by his successor." "When newspapers or periodicals are not taken out of the Post Office by the persons to whom they are addressed, the Post Master will, under his frank, give immediate notice to the publisher, stating the cause, if known." The above instructions will be strictly followed. Yours, MYRON B. WILLIAMS, P. M.
Present—The Mayor, Ald. Bennett, Dutcher, Johnson, Jones, Pease, Prentice, Rothe, Schurz, Steck and Weissert. The minutes of the last meeting read and approved. The resolution relating to the appointment of assessors was taken from the table, and after considering the same, on motion of Ald. Johnson it was again laid upon the table. Resolved, That the Mayor appoint a committee of three to express the wish of the Council to the persons elected as City Assessors, that they would resign their office in order that the provisions of the new Assessment Law be complied with, and that they report on next Monday. Whereupon the Mayor appointed as such committee Ald. Johnson, Prentice and Steck. Ald. Bauman presented his written resignation which was accepted and placed on file. WM. DUTCHER, Cleck. pro tem. In Common Council, July 12, 1858. Present—The Mayor, Ald. Bennett, Johnson, Lindon, Prentice, Pease, Quintmeyer, Schatz, Steck and Weissert. Presentation of petitions, memorials and accounts. By Ald. Schatz—Account of M. Canfield for work on streets, $5 00. Also account of Miles Norton for work on streets, $10 00. Allowed and charged to 6th ward fund. Blumenfeldt & Kopp for printing, $1 75. A. Herkeurath for services as constable, $2.21. Jacob Jussen for rent of engine house, etc., $14 25. Petition of Wenzl Quis and others in relation to the repair of the plank road bridge. Laid on the table. ICE CREAM SALOON. F. P. Brook & Co. have just refitted their Ice Cream Rooms at their Confectionary & Fruit Store on the bridge, and are prepared to serve up the Best Quality of Ice Cream Every Afternoon and Evening. Ice Cream furnished for Parties or Private Families on a few hours notice, in large or small quantities. Owing to the hard times we shall charge only ten cents a dish this season. The New Post Master.—The report of the appointment of a new Post Master of this city has been confirmed. Last week Gen. James Potter, an esteemed and respected citizen, received his commission from the President and is making arrangements to enter upon the discharge of his public duties. This selection, under the circumstances, will give universal satisfaction. The new incumbent has all the qualifications to make a popular and faithful officer, and we have no doubt that he will take pleasure in consulting the convenience of the whole community. He will commence his official career with the best wishes of all who know him, and will no doubt fully realize the expectation of his many friends. We congratulate him upon his good fortune. The New Post Office.—Gen. Potter, the newly appointed Post Master of this city has determined to remove the Post Office from its present location on Second Street to the Democrat Block, on Main Street. No one can reasonably complain of this change. A more central and convenient point could not be found. If the accommodation of the largest number should be the governing rule in the establishment of an office designed for the benefit of the public, then the choice made in the present case is wise and impartial. The new room is large and commodious, and will be fitted up in a handsome and substantial style. As soon as the necessary arrangements can be completed the new Post Master will enter upon the discharge of his duties—removing the office to the place which he has selected for it. A very difficult and successful surgical operation was performed just before noon at St. Mary's Hospital in this city . . . the patient being Herbert Kuehnemann . . . Eleven years ago . . . Mr. K. had the misfortune to have his left foot badly crushed. The member became deformed and withered and always troubled him yet he continued to work, walking on his heel which bothered him as a sore on the sole of the heel refused to heal, although every effort possible was made by physicians to heal the sore which refused to yield to treatment. As a last resort, it was decided that the only way to save the foot . . . was by the process known as skin grafting and yesterday Mr. K. submitted to the operation ... the patient was placed under the influence of an anesthetic and the skin around the opening . . . was removed after the sore was properly prepared by Dr. Habhegger, the dead skin covering a space of about three or four inches . . . After the skin was removed from the foot, Dr. Habhegger opened a place in the right leg of the patient between the knee and the thigh turning down the skin over a surface of about three by four inches and when everything was in proper shape and condition, the foot was brought over and the heel placed in the opening in the leg and the flap brought up to the heel. Blumenfeldt & Kopp for printing, $1 75. A. Herkenrath for services as constable, $2 21. Jacob Jussen for rent of engine house, etc.,$14 25. Petition of Wenzel Quis and others in relation to the repair of the plank road bridge. Laid on the table. The finance committee reported in favor of allowing the account of Jacob Jussen of $14 00 for rent of engine house for March and April. Adopted and charged to city general fund. Peter Rogan, having received the highest number of votes for the office of Alderman of the 3d ward, appeared, was qualified and took his seat in the Council. A Pic Nic to be a Pic Nic must be free, and relieved of all the stiffened forms of Etiquette and fusty musty rules of Codfish Aristocracy, while good humor and innocence run wild. Never were our ideas of what it should be more fully realized than on the occasion of the Pic Nic at Boomer's Grove on Saturday last. There were all the essentials to make pleasure prevail. The ladies had not only made happy the hearts of trusting swains by their presence, but had provided the essentials wherewith to relieve the cravings of appetite and taste. THE INDIAN WAR. Intelligence from Oregon establishes the fact that we have another Indian War on our hands. Some of the tribes of Oregon Territory have given unmistakable evidence of being actuated by deep feelings of bitter hostility towards the white population. They have murdered emigrants and attacked the troops of the United States while on their march through the country. The government is making a vigorous effort to meet this state of things. A sufficient force will be sent across the Rocky Mountains to conquer the Indians and bring them to terms of peace. Though it is hard to tell what are the causes of these outbreaks of savage cruelty, or who is responsible for them, there is but one way to deal with these wild men of the woods - that is to subdue them and then make it their interest to cherish peaceful dispositions. They no doubt feel as Indians have always felt when they beheld themselves crowded and pressed by settlers, and their lands passing from them - their first impulse is to exterminate the authors of their wrongs. But it is useless to struggle - their overthrow and extinction are only questions of time - their fate can now be foreseen. Closing out sale of Furniture and Bedding! Having purchased the entire stock of House Furnishing Goods formerly owned by Pike & McAlister, I will sell, for the next sixty days, without regard to cost, in order to close the business. The stock consists of tete a tetes sofa chairs [furniture intended to seat two persons, especially facing each other], lounges of every description, marble top, center and side tables, mahogany and walnut side tables, mahogany, walnut and cherry bureaus, bureau washstands, sink and common washstands, extension and common leaf tables, cane and wood seat rockers, cane and wood seat office and dining chairs, common kitchen chairs, and many other articles too numerous to mention, such as is found in a first class furniture store, all of which will be sold at a Great Sacrifice, in order to close the business by the 10th of September next. WM. L. CHURCH. Dennis' Block, West Side of the River. Watertown, July 14, 1858. CHAIRS—Mr. O. S. Howard has for sale, in Dennis’ Block, some ten dozen of common chairs. They were manufactured by Pike & McAllister and will be disposed of at the lowest cost figure. Those wanting them have now a chance to purchase a first rate article at the lowest price. A sort of miscellaneous vagrant, who registered himself as “B. B. Vandercook, Rochester, N. Y.” at the Exchange Hotel of this city, a few days since, sneaked away without paying his bill after staying there over a week, playing the “gentleman of leisure." We see he practiced the same game at Horicon. The Argus describes him as "a large, dark complexioned, heavy bearded young man, about 25; wears a dark figured morning gown, occupies the whole sidewalk when he travels, and says he is a brother of Vandercook, of Portage City. His baggage consisted of a pair of dirty socks and shirt, is here at the Winter House, where he would do well to call and settle for a week's board." Landlords will do well to be on the lookout when he makes his appearance. The finest fruit we have ever seen of the berry kind, were a few specimens of the new orange raspberry given us yesterday by Mr. W. Clark, in whose garden they were raised. They were large, sweet, juicy, and decidedly superior to any other variety we have ever known cultivated. These were picked from a lot of very small bushes procured at Rochester, N. Y., last spring. They thrive well here and promise to be a choice addition to our garden productions. New potatoes raised by our farmers are beginning to make their appearance in our streets. Mr. Walter Pease - who generally brings to this market the earliest and best varieties of garden vegetables that we get last week presented us with a lot of very fine new potatoes. Amongst the other abundant crops this year will be the potato. Probably more acres have put in the ground this season than ever before in this state, and the yield promises to be large. S. P. Day & Co. have a lot of lumber wagons for sale, which for strength, lightness and durability, cannot be surpassed. They were manufactured by Charles Wood, one of the most skillful of our mechanics. They are both handsome and serviceable vehicles. Notice is hereby given that I shall expose for sale and sell at public auction to the highest bidder, at my shop, in the Third Ward of the city of Watertown, in the County of Jefferson and State of Wisconsin, on Saturday, the 26th day of May, A.D. 1860, at one o’clock P.M., one red Sulkey or two wheeled carriage, the property of John P. McDonald, and now in my possession, for the purpose of paying the repairs made by me thereon, in accordance with the provisions of Section 14, of Chapter 153, of the Revised Statutes of the State of Wisconsin. First Street is now being macadamized [pavement of layers of compacted broken stone] which will be a great improvement to that thoroughfare, if done as it should be, which appears to be the case. The Ladies Festival, held at Cole's Hall, was a very successful effort towards accomplishing a good end - the payment of the small remaining debt that now hangs over the Congregational Church of this city. We have never seen that spacious hall fitted up more pleasantly, or tables more bountifully and tastefully spread. The attendance was large and all seemed to enjoy themselves finely. This was entirely an affair of the ladies, and like all their attempts to do something kind and useful, its success was brilliant, and reflects credit on their benevolence and enterprise. 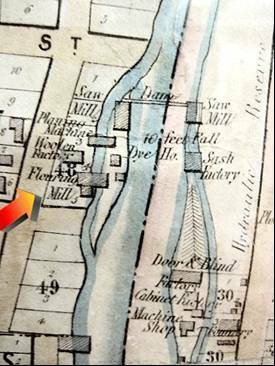 There is now an extensive Threshing Machine Manufactory in this city, carried on by Mr. F. E. Shandrew. Though only recently started, fifteen have been completed this season. They have all the latest improvements and will be found to be among the best now in use. Farmers in this region will find it for their interests to buy their threshing machines at this new establishment, for the reason that it will be a great convenience to have a place where they can come to get their repairing done. We learn that most of the machines made here have been sold cheaper than they could be obtained elsewhere, while in point of strength and finish they have been pronounced superior by good judges. When the motives are so great as in this case, we should by all means encourage our home manufactures, and do all we can to make them permanent and successful. We hope to see this threshing machine establishment one of the prominent institutions of our city - adequate to meet the growing demands of one of the best grain growing districts in the West. Without the help such labor saving inventions afford, the vast quantities of wheat raised in this State could never be prepared for market. In Cady's Addition to the City of Watertown. TERMS EASY AND PRICES LOW. Inquire of Myron B. Williams, Esq., Agent. Mrs. Engelmann has just returned from Chicago, where she has purchased a large and choice assortment of bonnets, flowers, and every variety of goods belonging to a first rate millinery establishment. She offers them to the ladies at the lowest prices. In this store there is also a Sewing Machine offered to the use of the public for two or three cents a yard. Headquarters of the 8th Regiment of Wisconsin Militia. Henry Mulberger is hereby notified and appointed Adjutant; Carlos A. Sprague, Quarter Master; W. M. Wright, Pay Master; J. R. Rood. Surgeon; J. M. Bingham, Judge Advocate - each with the rank of Captain. Also, Rev. E. P. Beecher, Chaplain, and H. B. Willard, Surgeon's Mate - each with the rank of Lieutenant; all attached to the Staff of the Eighth Regiment of Wisconsin Militia. By order of Harlow Pease, Colonel Commanding 8th Regiment. The Welsh Methodists are progressing with their church building on the West side of the river. The frame is up, the clap-boards on the roof shingled and the interior is being finished. In a short time it will be ready for service. They are supplying themselves with a very neat house of worship. It is finely located and easily accessible from all points of the city. The Welsh Church corner, North Washington and West Cady streets, has a new cement walk that is a credit to Edward Racek, who constructed it and to our city officials who laid out and looked after the work, especially so when compared with other corner walks in some parts of the city. The New Dam - Mr. W. H. Blanchard and Enos Salsich are now engaged in building a new dam across Rock River, a few rods below Main Street bridge, in place of the one that was carried away some six weeks ago by the great flood. The new structure will be built in such a way as to make it strong and permanent, and capable of resisting any amount of pressure that will ever be made upon it by any accumulation of water that is likely to flow over it. When completed it will furnish a splendid and reliable water power, sufficient to carry all the machinery that is now located on the river, and as much more as it may be profitable to put in operation. A large number of men are now employed on the work, the object being to get the structure done as soon as possible, so that the mills now standing idle may once more be set in motion. The two grist mills that depend on this power for water are among the largest and best in the state. Both are being thoroughly overhauled and repaired, and will be put into the best running order. When driven to their full speed, they are capable of manufacturing daily large quantities of the best quality of flour, and their brands stand among the first class in all markets where they are seen. They give steady employment to a considerable number of men, and their success is a matter of interest to all. I will sell the Hydraulic Reserve on the east side of Rock River, in the City of Watertown, or any part thereof, with the Mills and water power connected therewith, or lease the same for a term of years to any Party or Parties who will improve the same. None [sic] others need apply. This property is located in the central part of the city. The Reserve is within five hundred feet of the Planters Hotel and Bank of Watertown, and is capable of being divided into 20 or 25 lots suitable for mechanical or hydraulic purposes. By virtue of an execution issued from said Court in the above entitled action, to me directed and delivered, against the real and personal property of the above named defendant, Enos Salsich, I have levied upon and taken all the right, title and interest which the said defendant had on the nineteenth day of November, A.D., 1858, or at any time thereafter, in and to all those certain lots and parcels of land, lying and being in the city of Watertown, and county and state aforesaid, known and described as lots three, four and five . . .
. . . together with the flour mill on the south half of lots four and five, in block forty-eight, and all the water power and privileges, and all the rights, interest and privileges created and made on the west side of Rock river by the dam across said river abutting on lots one and two in said block forty-eight, except four hundred and fifty (450) inches appurtenant to the saw mill . . . I shall expose for sale and sell at public auction at the Planter’s Hotel, in the city of Watertown, in said county of Jefferson, on Saturday, the 4th day of June next, A.D. 1859, at one o’clock in the afternoon. Joseph Giles, Sheriff of Jefferson County, Wis. It seems we have that most infamous of all things among us—an infant killer. Last Tuesday afternoon some children, who were playing near Blanchard’s Brick Mill, accidentally discovered the body of an infant floating in the race. They gave the alarm and on its being taken out it proved to be a full grown but new-born child, which had all the appearance of having been first strangled and then thrown into the water as the best way of hiding the shame and concealing the odious deed of the authors of so fiendish a crime. Police Justice Hadley held a Coroner’s Inquest, the jury returning a verdict of death from some cause unknown to them. But for the barbarity of the punishment, the perpetrators of this heathenish act ought to be consigned to an enraged band of Blackfeet Indians and left to their vengeance. The torture inflicted would be none too hard for the slaughterers of innocents. The Red Mill on the west side of the river, carried on by Messrs. Salsich and the Greens, is now undergoing extensive repairs and receiving a new run of stone. These improvements will add largely to the capacity of this heavy milling establishment to accommodate the large number who daily resort to it with custom work and also greatly increase its facilities for manufacturing bread-stuffs. Mr. Enos Salsich is also doing another good thing in macadamizing that portion of Water Street which runs from West Avenue (today West Main) to the mills. This timely improvement will render the establishments down there easily accessible through every season of the year, and all who may have business to transact can go and come without being buried in mud and mire, no matter what the weather. We are glad to see these changes going on, as they indicate that our business men anticipate busy times ahead. In this expectation we trust they may not be disappointed. Here is a wide and inviting field for profitable manufacturing enterprises and it has only just begun to be occupied. We hope at no distant day to see it more generally appreciated and made available. The Red Mill, on the west side of the river, is among the best flouring establishments in this state. Since it has been owned by Mr. Enos Salsich it has been much improved both in machinery and its capacity to do work. He is now making a large addition to the south end of the main building, which will not only be a great convenience but add greatly to the business facilities of the institution. The flour that goes from this mill has always been regarded as fully equal to the best in the market and brings the highest price, which is the best possible proof of its superior quality. Last Tuesday afternoon a sad and melancholy event happened in this city—a painful incident all were sorry to witness, because it carried pain and mourning to two families, which were suddenly made desolate and lonely. Two bright and promising boys were drowned while bathing in the rapid current of Rock River, just below the new dam, opposite Enos Salsich’s Mills. One was the only son of Hon. Peter Rogan—an active favorite lad—a little more than eight years old, bearing his father’s name—and the other was Mitchelburne Knox, an intelligent and hopeful child about nine years of age, and son of Thomas M. Knox, Esq. It seems that these two, with another boy, thought they would like a swim, and chose a very dangerous place for the amusement—one that has heretofore proved fatal to several other individuals who have tried the experiment at that particular point. They made the attempt, unbeknown to their parents, became involved in the eddies of a dangerous stream, [and] after an interval of search were taken out dead and carried to their bereaved and stricken homes. Yesterday—one in the forenoon and the other in the afternoon—they were buried amid the grief of near and dear relatives—fathers, mother, brothers, sisters—and the sympathy of a large number of friends, who mingled their tears with those whose household had been suddenly clouded with sorrows of an irreparable loss. Words of consolation or comfort would be vain from us—God, who gives and takes, can alone heal the wounded heart and bind up the broken spirit. But we wish we could say something that would be of some service to the living—those who have not yet been called to weep over a calamity of this kind, but who may be far within the range of danger. This is not the first, second nor third time accidents of this fearful nature have taken place, at or near the point where the present one transpired, and we have repeatedly called public attention to that fact. That is no place for children to make their first efforts to learn the difficult art of swimming, for the reason that it is dangerous even for those who understand it. Small boys ought not to be permitted to go there, for that or any other purpose, and if they are, no one can tell what family will next be unexpectedly plunged into the depth of anguish by seeing the lad who left the paternal roof with a face radiant with joy and hope, brought back lifeless and dead. Far be it from us to cast the slightest blame on any one—least of all on those who are so heart stricken already by this Providence—but to others we speak, who may possibly learn and profit by this afflicting dispensation.